For the filling, pulse the cashews in a food processor to a crunchy crumb consistency. Transfer to a bowl. Without washing the food processor bowl, add the tofu and pulse to a mince-like texture, then add to the bowl. Pulse the remaining filling ingredients in the food processor until finely chopped. Transfer the filling mixture to a sieve set over a bowl. Cover, then leave to drain in the fridge for 5-12 hours. 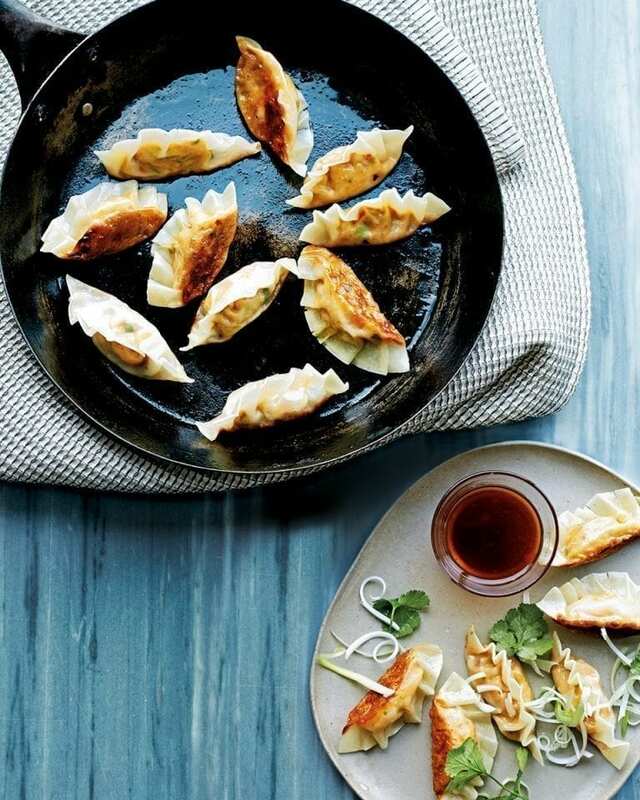 To assemble the gyoza, wet the edges of a wrapper with a pastry brush dipped in water, place a teaspoon of the filling in the centre of the wrapper, then pinch the edges of the wrapper together to enclose the filling. Sit the dumpling on its base and plump to flatten the bottom. Put on a baking tray lined with baking paper. Continue until all the filling is used. Cover the gyoza and keep in the fridge until ready to cook. Heat the oven to its lowest setting.Heat the frying pan over a medium heat with a glug each of sesame and vegetable oil, then add the dumplings (however many will fit in a single layer) bottoms-down and close together but not touching. Cook over a medium heat until the bases are an even golden colour. Add the boiling water (gauge the amount depending on your pan size) and bring to a simmer before covering the pan with the lid. Steam for about 2-3 minutes until the wrappers are becoming fairly translucent. Uncover and cook for a further 2-3 minutes until the water has evaporated and the bases are crunchy. Remove and keep warm in the low oven while you repeat with the remaining gyoza. To make the dip, combine all the ingredients thoroughly in a serving bowl. Serve the gyoza with the dip, scattered with finely sliced spring onions, coriander leaves and toasted sesame seeds. If you’re vegan be sure to buy gyoza wrappers, not wonton wrappers, which contain egg. Once assembled and before cooking, the dumplings will keep, covered, in the fridge for up to 24 hours. Or freeze by first open-freezing on a tray to prevent sticking, then pop into freezer bags. Defrost before cooking or cook from frozen for 2-3 minutes longer.